Second: Pick a backup series in case you can't find any criteria based off your first pick. 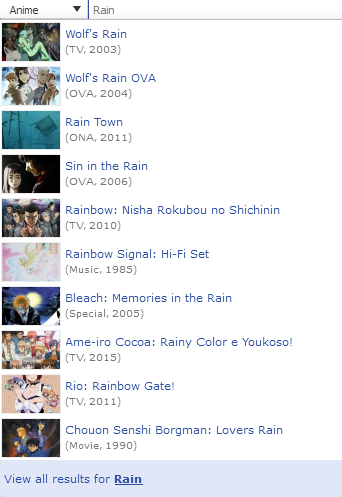 [ ] Watch one of the recommended anime on your pick's rec. page: Meganebu! [ ] Watch an anime with a song performed by the same artist that performed an ending song for the anime you picked: Yahari Ore no Seishun Love Comedy wa Machigatteiru. Zoku |　Can't use first option, using Nagi no Asukara ending by Nagi Yanagi instead. Watch an anime voiced by the same VA as a main character from your pick. Watch an anime from the same studio as your pick. Watch an anime by the same producer as your pick. Watch an anime by the same director OR storyboard of your pick. Watch an anime by the same script OR original concept/creator of your pick. Watch an anime that began airing the same day as your pick (any month/year). Watch an anime that began airing the same month as your pick (any day/year). Watch an anime that began airing the same year as your pick (any day/month). Watch an anime with the same number of episodes of your pick. 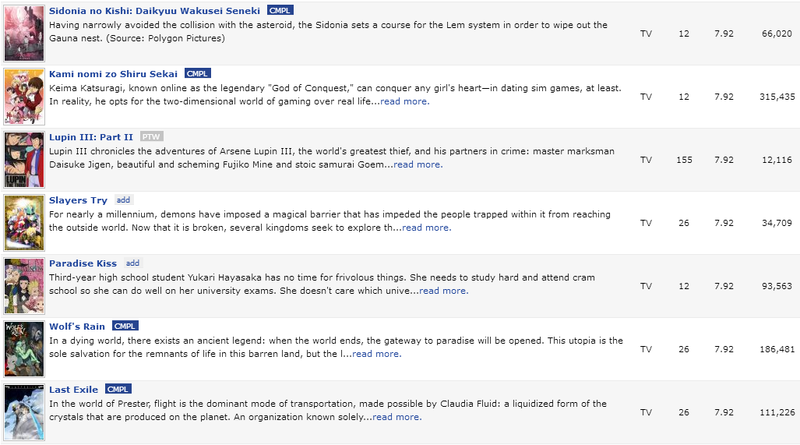 Watch an anime based on the same type of source as your pick (manga/light novel/game/original/...). Watch an anime with the same score rating of your pick. 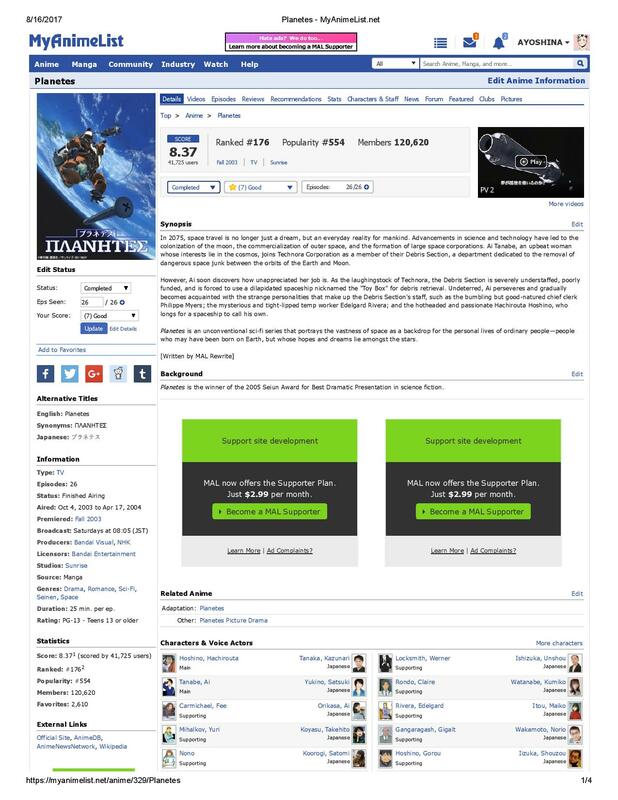 (If there is none, just pick the closest rating). Watch an anime from the same genre as your pick. Watch an anime from the same genre as your pick (using a different genre from the previous criteria). Watch one of the recommended anime on your pick's rec. page. Choose an anime from the predictive search using part of the title of your pick. Watch an anime that starts with the same letter as your pick. Watch an anime with a song performed by the same artist that performed an opening song for the anime you picked. Watch an anime with a song performed by the same artist that performed an ending song for the anime you picked. Watch an anime broadcasted on the same day as your pick. Watch an anime with the same duration as your pick. 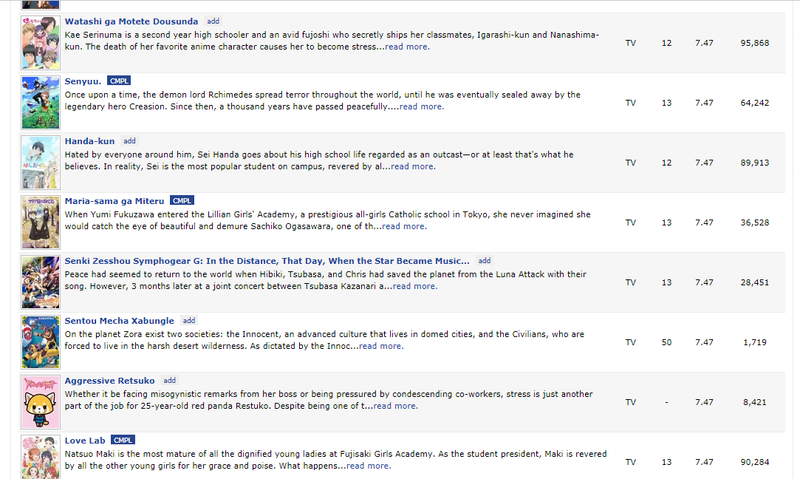 Watch an anime based on the same type of source as your pick ---「 Manga 」Gintama. ✔ Watch an anime from the same studio as your pick. - Love Live! Sunshine!! ✔ Watch an anime that began airing the same day as your pick - Patalliro Saiyuuki! -- [X] Watch an anime with a song performed by the same artist that performed an opening song for the anime you picked | [Minami Kuribayashi] | Kimi ga Nozomu Eien ? -- [X] Watch an anime with a song performed by the same artist that performed an ending song for the anime you picked | [Aki Misato] | Gunparade Orchestra ? Blassreiter ? //Expand your horizons using something you like as a starting point. Rules: Start date is the day you post. Any series already completed before the start of this challenge are invalid. 2nd Pick: Akame ga Kill! * F/SN: UBW has episodes listed as 28 minutes per episode and as far as I know, there are no-other shows that have the same so I went with my second pick. #03 ✔ Watch an anime by the same producer as your pick ― Watashi ga Motenai no wa Dou Kangaetemo Omaera ga Warui! [✔] ... that starts with the same letter as your pick: Wakaokami wa Shougakusei! [X] ... with the same duration as your pick: Elfin Lied | 25 min. Watch an anime that starts with the same letter as your pick: Kono Bijutsubu ni wa Mondai ga Aru! 2nd Pick: Servamp, there was no need to use it. [✔] ... that starts with the same letter as your pick: Chuunibyou demo Koi ga Shitai! [X] Choose an anime from the predictive search using part of the title of your pick: Full Metal Panic! [▼] ... that starts with the same letter as your pick: NHK ni Youkoso! 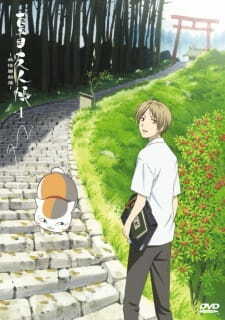 Watch an anime that began airing the same day as your pick ---「 7 」Ani ni Tsukeru Kusuri wa Nai! ♦ Watch an anime that began airing the same day as your pick ♦ 2nd ♦ Toradora! ♦ Watch an anime that began airing the same month as your pick ♦ April ♦ Haikyuu!! 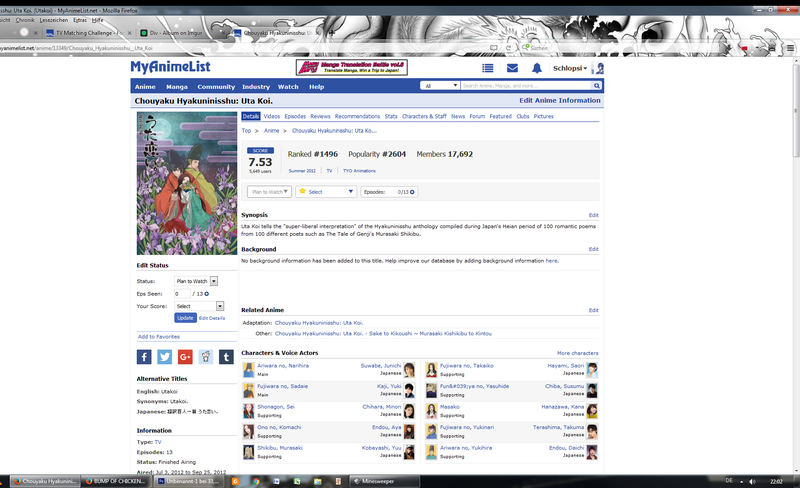 ♦ Watch one of the recommended anime on your pick's rec. page ♦ Durarara!! ♦ Watch an anime that starts with the same letter as your pick ♦ JK Meshi! If it starts with a number, the other series you watch needs to start with a number - it does not have to be the exact same number though..
2nd Pick: Katekyo Hitman Reborn!